Woman covers man in pork fried rice at China No. 1 restaurant in Vero Beach. 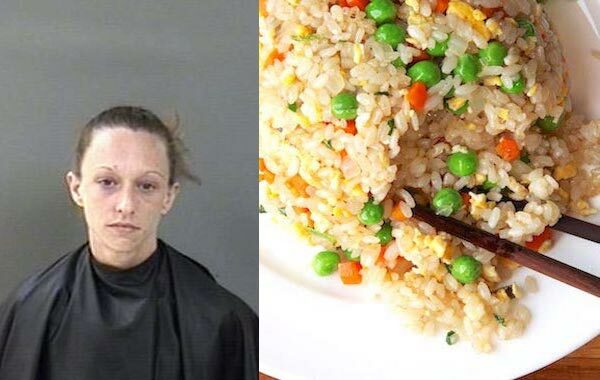 VERO BEACH – A 30-year-old woman was arrested after she covered her ex-husband in pork fried rice at China No. 1 in Vero Beach. The Indian River County Sheriff’s Office received the call on Wednesday at around 12 p.m. about an incident involving a male and female. Deputies made contact with the victim “who was covered from head to toe in pork fried rice and a red sauce,” according to the report. The victim said his ex-wife, identified as Samantha Holly Wilson, dropped off their son at the China No. 1 restaurant. The ex-husband told her that she can’t continue to keep her son out of school. Wilson then began to yell and scream at which point the victim told her to leave the restaurant. Before leaving, Wilson “slapped the plate of Chinese food up towards” the victim, causing the plate and food to strike his upper body and left shoulder, the report said. A witness at the restaurant said she saw Wilson throw a plate of food at the victim. Deputies then made contact with Wilson at her home. Wilson said she kept their son out of school because it was the last day for students. Wilson admitted that she got into an argument with her ex-husband and “reacted by throwing the food at him.” She said the victim had battered her in the past and it was a “reactionary response” in an attempt to distract him. Wilson was arrested and transported to the Indian River County Jail where she was charged with battery domestic violence.